A record of our wonderings, and conversations with kindred spirits. What are your thoughts regarding digital vs analogue play? Is it possible to achieve a balance? Digital, iPad and DVD decide time and play. Analog play, I want some imagination to be rich, play with a combination of some toys. Play origami and paper crafts, play in the park on a sunny day, play with your favorite toy on the terrace. What is your approach toward meals and nutrition? Healthy body building through food, thanks for food. Learn to eat fun and pleasure manners. Ever since meeting Hélène I’ve been a huge fan of @minois_paris , I find her passion, thoughtfulness and sense of style hugely admirable. Hélène started Minois soon after her daughter Paz was born, concerned about products on the market she set about creating natural skincare products with simple and honest ingredients. She has been kind enough to agree to share some of her wisdom and insight with us in a brief Q&A. What 3 words best describe the Minois philosophy? What advice can you share with parents regarding skin care for children? Use products with simple ingredients and simple formulations. What are your five favourite children’s brands? Fanny&Alexander, Soor Ploom, Misha and Puff , Whole and Liilukid. What 3 words best describe your philosophy towards parenting? 1. Respect. In a way that I always try to be respectful towards the needs of the children. Just like adults they might also not have their best day. Or don’t feel like having company or they might not have an appetite. And respect to me also means living it myself. By being gracious towards my children, other people and the environment, they might learn to make this attitude part of their own being as well. What I would love most for my children is to develop themselves as gentle souls who act with love, care and empathy towards the world around them. 2. Acceptance. Having four children myself, I feel that they all develop differently, have different personalities, possess different strengths and need different kinds of support. Every child is unique. I have my moments where I am wrestling with how to respond to my child’s uniqueness in contrast of my own. But I feel it is very important for them to feel my acceptance and my embrace. And that my love for them is unconditional. By loving and supporting them, I try to give them the confidence in themselves to develop a good sense of well-being, integrated in their sense of self. 3. Calmness. Having patience and staying calm is important for me. When I feel peaceful I am better able to parent my children. I am quiet a calm person myself, but having children sometimes brings along challenging situations. From our pre-school Montessori teacher I learned how to keep that calm, and parent from there. One of the thoughts from the Montessori philosophy that is really helpful to me is that we are our child’s guide. We don’t have to solve their problems; we are just there to guide them gently. We are there to help them through difficult moments, to be their support. And importantly, let them have all the feelings. What is your philosophy towards play? I love all natural materials, such as wood, linen, silk, wool, and hemp. In our home we have tried to work with those materials and create an inviting and enjoyable place to live and play in. I feel this is very important because children internalize everything from their surroundings. By surrounding children with beauty, children will develop their aesthetic awareness and appreciation. I love my children to play with simple, unfinished toys, rather than big plastic ones, because it allows their imagination to develop. Even tough my children sometimes feel attracted to the plastic toys from commercials, we try to minimalize buying those. I feel that when children are constantly exposed to synthetic/plastic toys, they are at risk of losing their sense of awe, of beauty and their sense of wonder and imagination. Next to that I don’t feel like buying mass-produced, low quality, automated and plastic toys, that will end up being thrown away after a short time. But, most importantly, it often turns out that my children will play with natural toys for much longer and with much more pleasure. They encourage creative, imaginative and meaningful play. Next to that I believe there shouldn’t be to many toys. Too many options lead to overwhelm. I always try to have few well-chosen, elegant and natural toys to play and discover with. What are your family’s 3 favorite children’s books? 1. ‘Mooi boek’ by Joke van Leeuwen, is a most wonderful book when you have just learned how to read. But in fact for everyone who loves letters. It is a book that surprises by showing abc’s in with nimble children and monsters. With comics and little notes. And a lot of language jokes that my children all love. 2. We love the simple and elegant stories of ‘Kikker & pad’ (Frog and toad) by Arnold Lobel. It is about the friendship between frog and toad, and how they do everything together. For instance when they both are scared, they try to be brave together. The book has humour and sensitivity, which make it very appealing for my children. 3. I am a huge fan of the author Toon Tellegen. I love all his books, but at the moment we are all loving ‘Is er dan niemand boos’ (The day no one was angry). It has a kind of humour I absolutely love, a sensitivity that is touching and the subject of this book is one I think every child and adult can relate to. All the animals in the wood are angry for different reasons. But one day, all the anger is gone and they don’t know what to do. What are your 5 favorite children’s brands? 1. Fanny & Alexander. Your philosophy is one I share. I love your beautiful, handcrafted toys. Both for myself as for my children. We all enjoy the look of the toys and I especially love the sentiment they give me. 2. Wooden story. All their toys are crafted in Poland’s Beskidy Mountains, with a wonderful ethos. They like to create playthings for children that are both natural and inspired by nature. They say their toys came to them from the mountains. And they do have that delicious forest smell as well. To me they are just beautiful in every way. 3. Encore. The beautiful dolls houses of Encore are made of 100 % solid beach, a decision driven by the wish to provide workers with good working conditions. Their toys can educate children how the environment works, and they will stand the test of time. For me the toys are real treasures, and I love the idea to pass them down from one generation to the next. 4. Mum and Dad factory. This Scandinavian brand creates beautiful children’s furniture from all natural and durable materials. Their beds, desks and little chairs are so beautiful and elegant; I could fill my home with these. 5. Misha and Puff. The knit collection of Misha and Puff is really special to me. With their knits they share their love for the thoughtfully designed and handcrafted. I adore their philosophy and the fact that their beautiful pieces will last forever. I’ve long been a huge admirer of @mama_2thelittleones , I find Esther's approach to parenting as well as life truly inspirational and heart-warming. She has been kind enough to agree to share some of her wisdom and insight with us in a brief Q&A. How would you sum up your parenting philosophy? Love, support/backing, freedom, safety/security/certainty by setting boundaries, giving structure by certain rhythms and our very own family traditions ....just some points that are important to us on our parental journey. The outdoors is obviously of great importance to you, what impact do you hope it has on your daughters' development? I think that every child gains self-confidence by being and moving in nature/in the outdoors. They already learn so much now. e.g. on how to take responsibility and care of themselves (by exploring new terrain and materials and seasons) and for others too...beyond that, I just hope that they feel and live the passion and excitement in nature one day when they're older. That they feel drawn to explore, adventure and be refreshed out there. Just like I experienced it when growing up with an outdoor life and time in nature...to never loose the wonder of nature's beauty and rich sources by living in and with it consciously and carefully. Nowadays a lot of kids don't have time for play anymore. The schedules of courses and programs and learning hours don't allow the 'just play' times. For me/us it's extremely important that my girls have an environment and circumstances where they can freely play and live in their own imaginary world. Where they don't feel watched and controlled by me or us. Play is essential for their growth and development. With that said boredom is part of that. I think boredom or times of where my kids are not busy with anything are necessary for them to get into playtime on their own. If that makes sense. Which book provokes your imagination most? Which book has your favourite illustrations? Do you have a favourite book character and why? Pompon from Mon chien Pompon by Iris de Moüy, because my pet Pompon was the muse for the book. Do you have a ritual when your parents read to you? For example, eating cookies and milk, covering yourself in your favourite blanket, hugging your favourite stuffed animal? Do you have a favourite breakfast dish? What about your favourite lunch dish? What is your favourite dinner dish? Fresh fruits salad, usually banana, kiwi and passion fruit. What is your favourite children’s clothing brand and why? I’ve always been in love with kids fashion so I couldn’t give you just one name! Apart from Bonpoint and Bonton, which are the must-haves of Paris chic, I have a soft spot for Les Zigouis, Wovenplay and Waddler. Their worlds seem to collide somewhere on a circus ring, among starry ballet tutus, large stripes, Pierrot collars, tamer’s capes and slightly tight suit jackets. That fascinates me. 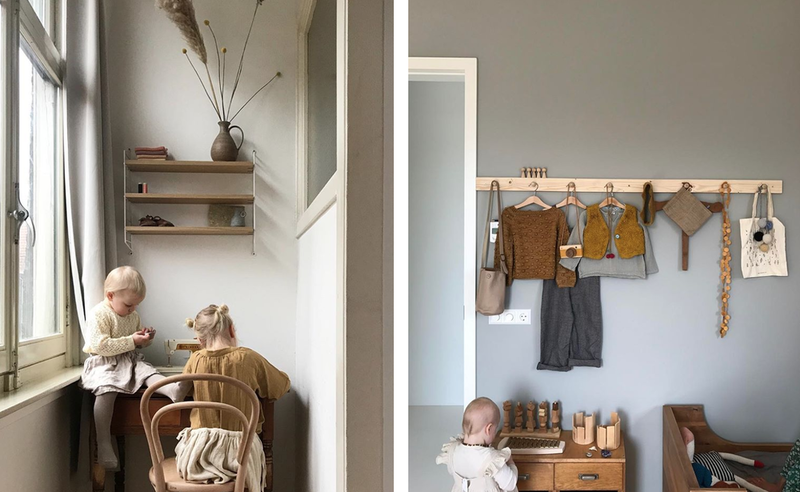 I also love the amazing knitwear of Misha and Puff and Œuf NY, the retro-functional style of Wolfechild, the Brit Chic of Caramel baby & child, the hilarious world of Annika, a Korean brand, and all the linen clothes of La Princesse au petit pois. What is your philosophy regarding dressing your daughter? I still have a few years left before she gets to choose her own clothes so for the time being I’m just having fun! In terms of style, nothing is sacred so I go for unlikely combinations. I love to mix very chic items (bloomer in Liberty fabric, English shoes…) with wacky finds. On the other hand, I can’t afford to buy all the things I like! So I learned how to sew when I was expecting and decided to tailor a custom-made wardrobe. The first year alone, I must have sewn at least 10 Pierrot collars blouses! But most of all, I cherish her comfort. When I’m taking her out for a stroll and she’s wearing her tutu and a pair of plastic boots, I’m not watching her every move forbidding her to climb or jump for fear of some stain – I just let her be. What is your philosophy regarding play? Unlike my oldest children, she doesn’t get a ton of toys for her birthdays. I remember too clearly their rooms being crammed with so many little things that they would barely use. Now, I cherry-pick one or two very nice toys, and the whole family gathers to offer the gift. Until now, we've managed to hit the mark! I personally find the handmade toys so much nicer. What 3 words best describe the Mabo aesthetic? What 3 words best describe the Mabo philosophy? My wild and expressive girls, my clothes from childhood that my mother saved, nature (the mountains), children with messy hair, old films and photographs, and soft fabrics. I’ve long admired @soloskates , Kate has a wonderful sense of style and creativity and her children are utterly adorable. Her approach to parenting is particularly admirable and I’m thrilled to be able to interview her! I've always tried to encourage my children to use their imagination as much as possible, whether with role-play, arts & crafts or outdoor play. We are lucky enough to live close to Hampstead Heath and spend lots of our time outside, exploring, climbing trees, building dens, treasure hunting and making pretend bows and arrows from sticks. In the garden we make campfires and spend hours acting out elaborate tales in the teepee. Our outdoor play is often inspired by nature’s props, I love that the children get so excited by what they see around them. At home I try to involve myself as much as I can with their play. We play lots of board games and learning games together and of course plenty of silly dressing up & pretend-play but there are also times when I encourage them to play by themselves. I think it’s important for them to develop independence and to have space to explore their own imagination. It’s a balance that I'm constantly working on. Apart from a cartoon and some old family home movies that I have stored on my phone, the kids are not exposed to that much electronic play. I used to have some learning apps on my phone but I found that they created arguments and made the children possessive. Seeing this effect on their personalities definitely made me reassess how much contact they have with electronic devices. I wont lie, over the years we have accumulated our fair share of plastic and battery operated toys and I'm pretty laid back about what they chose to play with but I feel that these types of toys don't tend to hold their attention for very long. Given the choice they would much rather an afternoon of pretend play or board games. We do watch movies together on a regular basis and the children have recently been given a music player for their bedroom. Music is a hugely important backdrop to life in our house and it gives me great pleasure to see them exploring their own musical tastes. In relation to my own family, I guess I take the view that some exposure to digital play is ok, when it is accompanied by clear boundaries. I know that my kids get plenty of attention, interaction and varied indoor and outdoor play so yes I do think it’s possible to achieve a balance. Most importantly I think that the right balance has to come from whatever you feel comfortable with & what works best for your family as a whole.